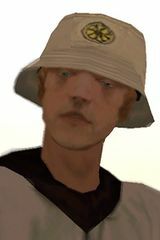 Maccer (born 1965 in Salford, United Kingdom) is a character in the 3D Universe who appears as a minor character in Grand Theft Auto: San Andreas. Maccer is the lead singer of the Gurning Chimps and is on his first tour of America. He is voiced by Shaun Ryder. Maccer maintains a website, http://www.maccer.net. Born in Salford in 1965, Maccer broke into the music scene in an unknown year. He invented a musical style that became known as "EXTREMELY BAGGY", and became notorious for his hard partying lifestyle, usage of drugs and self abuse, and for breaking musical taboos. This lifestyle would leave Maccer with a stuttering voice and hypersexuality in the form of compulsive masturbation. Forming a band called the Gurning Chimps under the management of a man named Pabsy, the Chimps embarked on a world tour. At some point during the tour, Pabsy vanished and the band ended up under the management of Kent Paul, who took them to America. Kent Paul hooked the Chimps up with a local drug dealer named The Truth, who took the band into the Bone County desert on a "peyote safari". The trip went bad, with Truth waking up separated from the band in a Los Santos bathhouse. Truth asked Carl Johnson to go find them out on Arco del Oeste, but by the time CJ found them, the other members of the Chimps had vanished, leaving Paul and Maccer behind. CJ took Kent Paul and Maccer looking for the rest of the Chimps, but after a close encounter with some angry snake farmers and no sign of the other Chimps, Paul decided to hope they made it back to civilization, saying that "keyboardists and bassists are a dime a dozen anyway". Paul asked CJ to drive them to Las Venturas, where his old friend Rosie was involved in running Caligula's Palace. Caligula's was owned by three feuding Mafia families, with Rosenberg set as a neutral party. Paul and Maccer were taken hostage by Salvatore Leone to ensure Rosenberg's cooperation. When Salvatore asked CJ to perform a hit on Saint Mark's Bistro in Liberty City, CJ tricked Salvatore into letting Rosenberg, Paul and Maccer go with him as backup. Instead of actually taking them, he had them leave for Los Santos. On arriving in Los Santos, Kent Paul and Maccer stayed in Madd Dogg's Crib as CJ's guest for the remainder of GTA San Andreas. After the events of San Andreas, Maccer found the other members of the Gurning Chimps and carried on with a world tour. He was later banned from Australia and went into rehab, using the Epsilon Program. Maccer’s career was effectively stopped during this period due to a series of legal battles, including one lasting seven years, limiting the use of songs by the Gurning Chimps. In 2004, Maccer began planning a come back tour. During the mission Don Peyote if the player waits long enough Maccer will say he has to use the bathroom, and will then get out and urinate. A small animation will be shown before he gets back in the car. According to a cut line, Paul says that Maccer is priapic; a syndrome where an erection lasts for several hours, or even days. This condition is actually very painful and if the blood making the erection doesn't flow back into the body it will stagnate and make matters worse. Priapism can be very common with individuals who have done narcotics such as Cocaine and other blood pressure raising drugs like it. However, this may just be Kent's way of sarcastically insulting Maccer. During Grand Theft Auto: Liberty City Stories (set in 1998), Head Radio DJ Michael Hunt mentions that he was at a backstage party for the Gurning Chimps, during which Maccer was sick on his shoes. The censored animation of Maccer urinating. Concept art for Maccer from GTA San Andreas. ↑ Grand Theft Auto: San Andreas page. Internet Movie Database. ↑ 2.0 2.1 Maccer.net (Rumors tab). Rockstar Games. ↑ Maccer.net (Music tab). Rockstar Games. ↑ Maccer.net (Come Back Tour tab). Rockstar Games. This page was last modified on 25 April 2014, at 13:42.